When it comes to improving the quality of healthcare, experts across the industry are recognizing that preventive care is a crucial component. One key may be putting the primary care physician (PCP) at the center of the patient relationship as a coordinator who can help patients better understand their care plans, adhere to medication regimens, and improve wellness to reduce visits to the emergency room, all of which meets current goals to rein in spending on emergency visits by focusing on preventive care. Several states agree that investing in primary care is a necessary part of reducing the associated high costs of reactionary healthcare. In fact, it’s the reason that Oregon passed a mandate requiring, by 2023, 12% of its medical spending to go to primary care, modeled on an earlier Rhode Island program. Delaware has likewise passed legislation this year that, among other requirements, demands an investigation by January 8, 2019 into whether the state should be directing 12% of its healthcare spending to primary care. With this renewed focus on supporting primary care, it’s possible that the concept of the patient-centered medical home (PCMH) model—which is defined by placing primary care near the center of a collaborative healthcare team focused on the patient’s complete wellness—may finally be seeing its time. The Patient-Centered Primary Care Collaborative (PCPCC) sees the PCMH model as a foundational element of solid preventive care. In fact, the PCPCC’s first-ever 2018 Evidence Report examined the interaction between the PCMH model and accountable care organizations (ACO), finding that Medicare ACOs with a higher proportion of PCMH PCPs were more likely to generate savings and had higher clinical quality scores related to preventive screenings and services as well as chronic management. For physician practices already looking to work better with specialists and the surrounding community, the PCMH model likely isn’t that far a stretch. “While Ryan Health has adopted and changed some of its practices to achieve PCMH recommended practices, many of the plans and workflows that were already in place or under consideration were already aligned with the PCMH model of care,” explains Lauren Mendenhall, associate director of quality management for Ryan Health, a series of 18 health and outreach centers in New York that has held PCMH recognition since 2011. Rather than having to reprioritize strategies or change its system entirely when applying for PCMH recognition, Ryan Health only had to make limited changes. For example, says Mendenhall, the system moved from walk-in to same-day appointment types to expand acute care capacity, expedited the implementation of care plans, and identified high-risk populations. It’s in that last area—serving high-risk populations who need help managing chronic conditions—that the PCMH model may be particularly important. The PCPCC has worked to evolve the PCMH model with its 2017 update to the Shared Principles for Primary Care, which were first introduced a decade earlier. Ann Greiner, president and CEO of the PCPCC, notes that the update was partially meant to reflect the growing appreciation for how social determinants impact overall health. “So, your eating and exercise patterns, your ability to pay for your medicine, your health literacy to understand what is being communicated to you are all social determinants, and all have a huge effect on health outcomes,” she says. Mendenhall sees quality incentive funding to address social determinants of health as the current greatest need to better support PCMH models. But the greatest challenge to the PCMH model may not be convincing people of the value of working with a PCP, but creating an operational model that financially supports aligning the PCP with the patient and placing that physician at the center of a team of caregivers. “[The PCPCC has] a well-articulated vision for what we want primary care to look like, and a large percentage of the PCP workforce (20%–25%) practicing in these models, but financing or the payment model has not reformed as rapidly as the caregiving model,” Greiner notes. That under-investment comes at a tremendous cost. One Oregon study found that every $1 invested in primary care ultimately saved $13 in downstream costs. In fact, that analysis of the state’s investment in the PCMH model reportedly found $240 million in healthcare savings in just three years. Supporting physicians is one half of the financial battle. “The other step is to work on existing benefits design that unfortunately gets in the way of people getting to primary care,” Greiner says. A study from the National Center for Health Statistics at the U.S. Centers for Disease Control and Prevention found the percentage of privately insured American adults ages 18–64 with high-deductible health plans rose from 26.3% in 2011 to 39.3% in 2016. “If you have a high-­deductible health plan and you have to pay $1,200 or $5,000 through your deductible, you’re probably not going to go get that primary care visit that you need, which may end up in a much more expensive visit down the road,” Greiner adds. The PCPCC is working to change those benefit designs, she notes, but it’s a battle that will take time. The PCMH model is about getting patients the appropriate help they need, and this demands both the ability for the PCP to spend quality time with the patient as well as the seamless communication of health information from patient to PCP to specialist and back again. Seeing as how lack of time, lack of financing, and perhaps too much unintegrated technology rank among today’s significant roadblocks to quality healthcare, this is no small challenge. But one part of the solution, as the PCPCC sees it, is focusing on the PCP as a sort of coach—one who can lead his or her team to the win. Building that team, Greiner notes, includes helping patients and families better engage in their own care and decision-making to improve health outcomes. But it’s also largely about connecting patients with the appropriate professionals to address their full health needs. The problem, again, comes back to financing. “Although this is changing, most practices remain on a volume basis so the more you do the more you get paid, and that might work for some parts of the medical field, but it doesn’t work for primary care,” Greiner says. “We need a primary care system where physicians, nurse practitioners, physician assistants, and others spend more time with patients, not less.” But in keeping with the goal of cost-effectiveness, the model must also work for patients who need minimal attention. Patients with an easily addressed complaint don’t need to be seen by a physician, and referring them to the appropriate team member both frees up the physician’s time and gets the patient seen more quickly. Reducing the administrative burden upon physicians is another part of this solution. Ryan Health has held PCMH recognition since 2011, which is when the National Committee for Quality Assurance first launched the recognition program. One of the ways the New York health system works to give PCPs more time with patients is by adding administrative support to the team. “We have adopted the care team model, which has focused on relieving the provider of many administrative duties and providing them the support needed to focus on the patients and patient care,” says Ronald Jean, practice facilitator for Ryan Health. But there’s another challenge PCPs are facing. Given the increasing costs of healthcare, more consumers are taking the PCP off their team entirely and heading straight to a specialist to deliver care for more complex needs. The Health Care Cost Institute’s report on spending in 2016, published earlier this year, found that PCP office visits declined by 18% from 2012 to 2016, while spending on specialist office visits increased by 30% and was a primary driver of the overall spending increase on healthcare services. In 2016, the report notes, office visits to specialists were more common than office visits to PCPs. Researchers noted that the study did not explore possible substitution effects, such as patients using specialist office visits in place of their PCP office visits, or the possibility that changes in insurance plan design may have led to changes in access to physicians and specialists. While financial considerations are a major concern, streamlining the process of getting to the right specialist is another challenge that service providers are addressing to boost utilization of PCPs and the PCMH model as a whole. 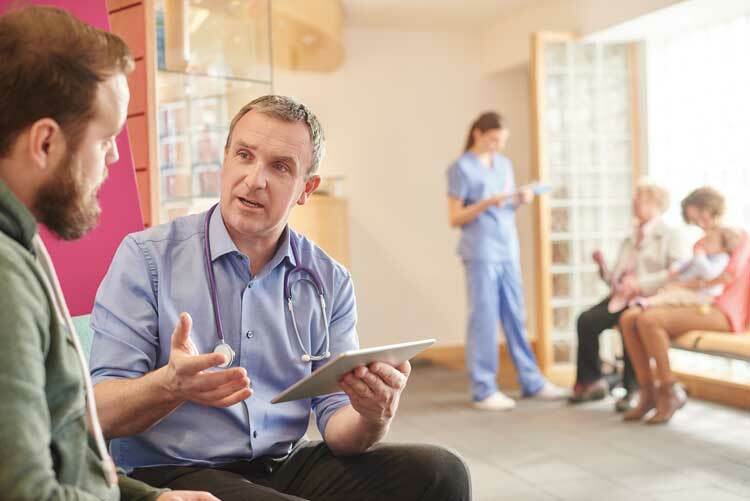 The team-based approach requires a solution to simplify transitions of care as physicians refer patients to specialists outside their practice. A number of solutions are being developed to streamline communication electronically between physicians and from patient to care provider. Adam Darkins, chief strategy officer of AristaMD, describes his company’s SmartCare platform as a high-quality, low-cost telehealth platform aimed at reducing the time patients spend traveling between PCP and specialist. “An exciting part of the AristaMD process is to iteratively work between primary care and specialty care to improve the relationship between the two in terms of referrals,” he says. While more insurers are allowing telemedicine options—including Medicare, with the loosening of telemedicine restrictions in the CHRONIC Care Act passed in February 2018—a visit with a PCP remains an initial touchstone for many people seeking care. While they wait for payment methods to further evolve, technology solutions are working to close the transition gaps. By 2017, 65% of hospitals had fully implemented a telehealth solution in at least one unit, with 13% more beginning implementation, reported the American Hospital Association. Meanwhile, 52% of individuals were offered online access to their medical record via a patient portal by a health provider or insurer in 2017, found the Office of the National Coordinator for Health Information Technology. However, just over half of those who were offered online access to their record (28% of people nationwide) took the time to view it. Challenges in accessing technology solutions and patient education indicate that implementing solutions to put the burden of the full data review back on the physician—think EHRs integrated with telehealth options—are more likely to help the PCP get a full picture of patient health. That’s why, Darkins explains, some solutions available today are designed to interface with current IT implementations as an interim solution to a fully integrated central EHR. While the PCMH model faces its share of challenges, today’s fast-­evolving healthcare industry hasn’t written it off yet.